We had a very large, airy house (built in the spring of 1999) with decks on three sides. The six bedrooms, large kitchen flowing to the family area, den, five and one half bathrooms, and five television sets allowed us to spread out in comfort. The best part of our surroundings was the hot tub and swimming pool. 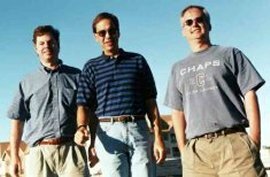 Dan, Tom, and Bill greet our vacation home. 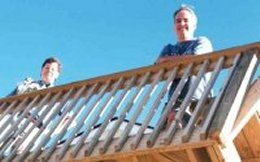 Southern Shores is an entirely residential community just north of Kitty Hawk. Although there are no commercial businesses in the town of Southern shores, shops and restaurants are just minutes away by car or bike. To the north is the towns of Duck and Corolla and the Currituck Beach Lighthouse. At the intersection of Route 158 and Route 12 are the towns of Southern Shores and Kitty Hawk followed to the south by Kill Devil Hills and Nags Head. Further south on Bodie Island is Route 64 that leads into Roanoke Island and the towns of Mantio and Wanchese. On the southern tip of Bodie Island is the Bodie Island Lighthouse. Crossing over to Hatteras Island we enter Pea Island National Wildlife Refuge followed by the Cape Hatteras National Seashore Recreation Area. 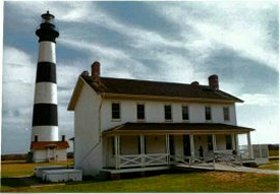 Several small hamlets of Rodanthe and Avon led to the Cape Hatteras Lighthouse. Crossing over the free ferry to Ocracoke Island leads one to the Ocracoke Lighthouse. Ocracoke was a favorite haunt of Edward Teach, the infamous pirate Blackbeard. In 1718 he was killed off Ocracoke in a hand-to-hand battle and then beheaded. Ouch! 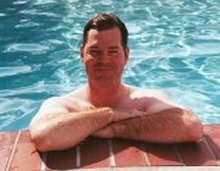 After performing his domestic duties at the kitchen sink, Tom takes a much needed break at poolside. Tidbit: One of the Outer Banks' mystery is Roanoke Island. More than 400-years ago, two explorers returned to England with tales of the "goodliest land under the cope of heaven". Soon after, the first permanent European settlers to the "New World" arrived at Roanoke in 1585. The settlement disappeared without a trace. The story of Sir Walter Raleigh and his colonists is presented each summer in The Lost Colony, the first and longest-running outdoor drama in the nation. It debuted on July 4, 1937. History: The treacherous waters that lie off the coast of the Outer Banks bear the name "Graveyard of the Atlantic". It is a grim, but fitting, epithet, for here more than 600 ships have wrecked, victims of shallow shoals, storms, and war. 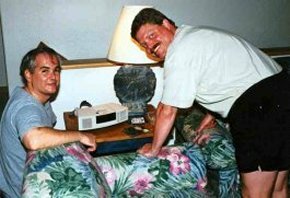 Dan and Bob play with the CD player. On a visit to the Outer Banks dwarfed, odd-shaped trees may catch your eye. The salt-laden winds have severely pruned these trees, an example of how the sea affects living things. Closer to the sea, shore birds are seen patrolling the beach for food. Some catch small fish or crabs carried by waves, while others probe the sand or search under shells for clams, worms, and insects. 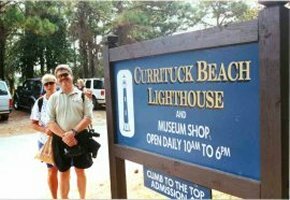 Bob, Sheila, and Bill visit the Currituck Beach Lighhouse where they walked up the challenging spiral staircase for a panoramic view of the ocean, Currituck Sound, and the thin strip of land between. 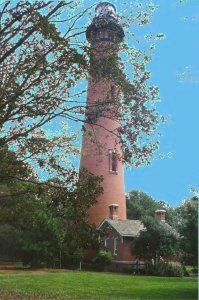 Historic tidbit: The Lighthouse Eastablishment built the Currituck Beach Lighthouse in 1874, the same year the famous Life Saving Service began building stations every six miles down the coast from the Virginia state line. We were told to be careful about the wasps that live and fly around the top of the lighthouse. Further history: The Currituck Beach Lighthouse located in the town of Corolla is the youngest lighthouse on the Outer Banks. It is also the only lighthouse open to the public, where the hike to the top is 214 steps around and around the spiral steps. Before the advent of electricity, a mechanical means was required to rotate the huge lenses that m ade the light appear to flash. A system of weights suspended from a line powered a clockwork mechanism beneath the lantern - much like the workings of a grandfather clock. The keeper cranked the weights up by hand every two and a half hours. Historical Info: Roanoke Island's English-speaking history goes back 22 years before Jamestown and 35 years before Plymouth Rock, when the first English colonists settled there among the Algonquin Indians between 1584 and 1587. The island is also the birthplace of Virginia Dare, the first English child born in the New World. The Wright Brothers National Memorial is dedicated to the two brave brothers, Orville and Wilbur from Dayton Ohio, who in 1903 became the first men to ever achieve powered flight. 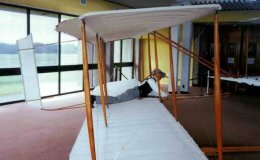 The Visitors Center features an interactive museum that explains the principals of flight, as well as the method and inspiration that the Wright brothers drew from to achieve their first flight. The auditorium houses life-size replicas of the Wright Flyer and the 1902 glider. For additional information call 252.441.7430. On December 17, 1903, Orville lifted the plane from a wooden track, climbed about three meters into the air, swerved irregularly up and down several times, and came to the ground about 30 meters from the take-off point. The first machine-powered trip lasted 12 seconds. Three additional flights that day were performed, with the longest covering 260 meters, lasting 59 seconds, and piloted by Wilbur. The Wright Brothers National Memorial stands on a 90 foot stabilized sand dune, Big Kill Devil Hill, that was the actual dune used by the Wright brothers to achieve their historic flight. The pylon cornerstone was laid on December 17, 1928, the 25th anniversary of the first flight. It was attended by Orville Wright and Amelia Earhart. Have you ever dreamed of soaring through the sky or flying like a bird? Well, you can at Jockey's Ridge State Park in Nags Head. Towering above the surrounding landscape, Jockey's Ridge stands as a monument celebrating the natural wonders of the Outer Banks. The largest sand dune on the Atlantic Coast rises over one-hundred feet above sea level. In 1975 the National Natural Landmark was preserved as Jockey's Ridge State Park where 420 acres contain a unique assemblage of shifting sand ridges, dense shrub thickets, and soundside habitats. 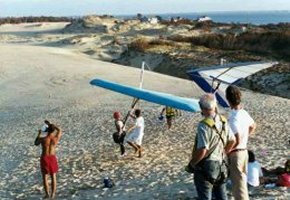 The world's largest hang gliding school, Kitty Hawk Kites, can also be found conducting daily hang gliding lessons within the park. The gently sloping dunes, soft sand, and ocean winds make learning to hang glide easy and fun. Elizabethan Gardens, a living memorial to our English colonists, is located on Roanoke Island near the town of Manteo. The Gardens were created in 1951 by The Garden Clubs of North Carolina, Inc.The unique American garden contains myriad varieties of plants, wildflowers, and indigenous shrubs and trees. 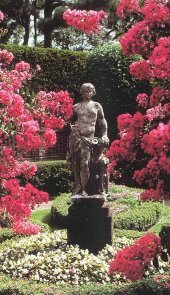 The ancient garden statuary and ornaments provide a historical setting at the site of the first English Colony in the New World. In Roanoke Island Festival Park we climbed aboard the Elizabeth II, a 69-foot sailing vessel representative of those sailed to the New World in 1585. 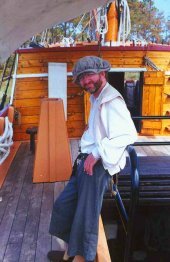 While exploring the ship a 400 year old mariner told tales of sea voyages and the everyday activities of crew and passengers. The ship was constructed in 1984 based on one owned and sailed by Thomas Cavendish. Later we saw the 45-minute film The Legend of Two Path about the Native Americans of Roanoke Island and wandered the boardwalks at the water's edge. Inside the museum we visited hands-on exhibits, artifacts and information spanning four centuries. The Bodie Island Lighthouse is located eight miles south of the U.S. 158 and U.S. 64 intersection. 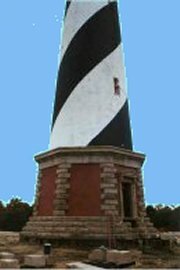 The 156-foot high horizontally-striped lighthouse was completed in 1848. It keeps a silent watch over the Oregon Inlet. Windmill Point Restaurant and SS United States Lounge hosts the world's largest collection of memorabilia from the SS United States. 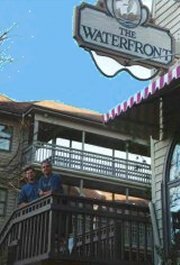 From the spectacular sound view to the grandeur of the cuisine, we highly recommend this eating establishment. It is located at milepost 16.5 on Route 158 bypass in Nags Hags overlooking the Roanoke Sound. 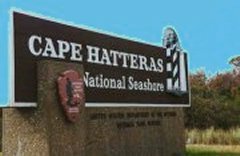 The sign at the entrance of Cape Hatteras National Seashore. 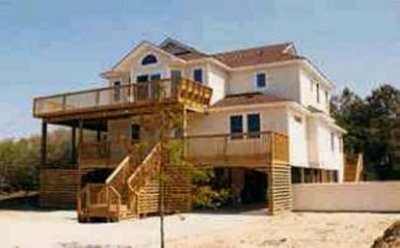 The seashore extends 70 miles from South Nags Head to Ocracoke Inlet and includes Bodie, Hatteras and Ocracoke islands. State Highway 12, a narrow, paved road, links the three islands. The highway also passes through 8 villages that reflect the nearly 300-year-old history and culture of the Outer Banks. The seashore on Hatteras Island stretch like a brown and green ribbon spaced between the sound and the ocean. 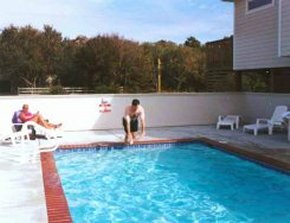 Hatteras Village and Hatteras' south facing beaches are perfect for swimming and sunbathing. It is perhaps the most picturesque of the seven villages with a variety of shops and restaurants. The free ferry to Ocracoke Island departs from Hatteras on a regular daily schedule and makes for a perfect day trip. The Cape Hatteras Lighthouse has recently made a historic journey from its place by the edge of the sea, where it stood guard for almost 130 years over the dreaded Diamond Shoals. It sits now, encircled by a forest of scrub pine and myrtle, some 1,600 feet from the ocean that threatened to take it. Although their exterior is understated when compared to their dining, JK's offers the distinctive flavor of aromatic wood cooking to their steaks, veal, lamb, ribs, chicken, and seafood. Tom and Dan were especially pleased with their flounder. JK's is located within the TimBuck II shopping area in Corolla. Tom made it a point to do his laps in our pool. The water here was a lot cooler than the 103 degree waters of our hot tub. Of course, the glass of wine sat equally well on the border of the pool and the hot tub. "We're glad you're Here!" announces each visitor to TimBuck II, a comprehensive shopping area in Corolla. One of its unique shops is "The Glass Shop" where local designer Renee Hilimire custom designs everything from stemware, furniture, and floorcloths. To contact her call 252.453.3999. Bob and Sheila pose for one of Bill's endless photograph sessions during dinner of chicken, steak, and hamburgers....wine is (as usual) a given. 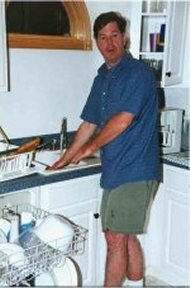 Being a vacation to relax, Dan hardly spent any time in the kitchen. Tom and Dan made up for this extra time sitting in front of Dan's computer monitor, that was expertly hooked up to internet services by the Boston, Massachusetts-based company "Cambridge Computers". On the other side of the huge dining room table sat Tom and Dan. Of course, Bill's taking pixs again. One afternnon Bob and Sheila took a bi-plane ride over the sand dunes of Jockey's Ridge State Park while Bill practiced diving his new sport kite into the sand. There was little chance that the aeroplane and kite would collide, since the kite spent most of its time marooned in the sand. 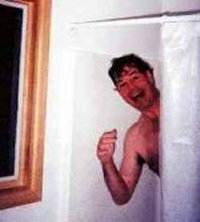 Tom's taking another shower, but this time he is located in the comfort of his own bathroom. He still can't keep away from the paparazzi photographers who find him again. That's two straight vacations Tom is caught wearing only his smile. The one thing we wished we had done was to visit the Corolla Wild Horses. Harnessed to the decks of Spanish galleons, the horses were an integral part of New World exploration. The Spanish were unable to establish a colony here when conflicts with the Native Americans forced the explorers to flee to their colonies in Florida, leaving behind all their livestock. Other Spanish-bred horses made their way to the Outer Banks aboard English ships. The corolla herd is descended from Spanish mustangs which landed on these shores more than 400 years ago. The boys are on their way to dinner at Clara's on Roanoke Island. Clara's Seafood Grill overlooks Shallowbag Bay. We also ate at Owens' Restaurant at milepost 16.5, Beach Road, Nags Head. 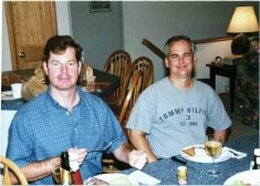 The Owens' family own three of the most established, most popular eateries on the Outer Banks - Owens' and RV's in Nags Head and Clara's in Manteo. 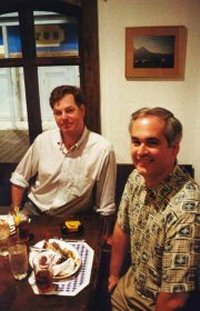 As they say of themselves, Owens' serve "classic Southern coastal cuisine steeped in Outer Banks history". Clara and Bob Owens started the tradition with a hot dog stand in Manteo. In 1946 they moved across the wooden bridge that spanned Roanoke Sound to a practically barren strip of sand and sea oats known as Nags Head. We didn't eat at RV's but did watch a group of mammals swim along the restaurant's shoreline helped along in their feeding by the outside lights. Across the waters from Clara's is the sailing ship Elizabeth II docked at the Roanoke Island Festival Park.